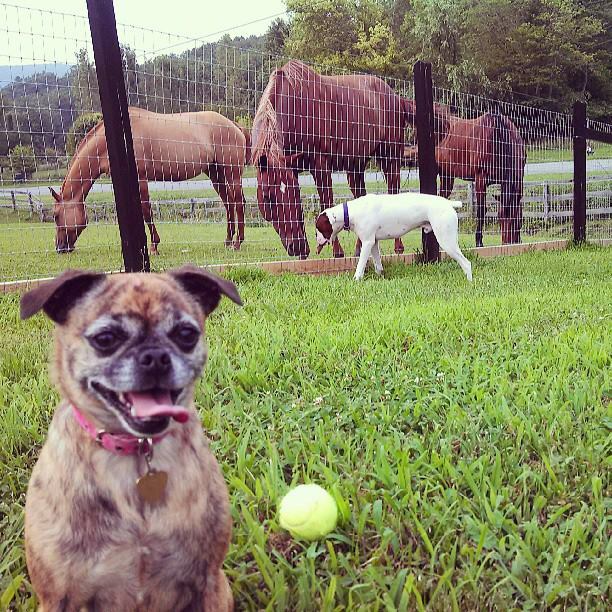 We have had a lot of excitement lately here on Bluebird Farm with our own private dog park.We have recently fenced in our front pasture with dog fencing so our dogs can run and play. Now we can have "special needs" dogs come out and play. It was Miss Lexi's 13th Birthday this week so we thought we would share with all of you our latest project we spent six months building for our five beautiful dogs here on Bluebird Farm. Miss Tallulah, Miss Lexi and my handsome deaf boy Nitro all enjoying the morning sunshine! Now we can have other dogs over to run and play with our five dogs. Here are some recent photos of The Lang Family visiting us with their foster dog Dozer and their American Bulldog Henley. My boys had a blast with their boys. We sure hope you all had a great summer. We are looking forward to cooler temps here in Virginia soon! Look at the deafies running together. Doesn't Dozer (L) look so happy and Bud (R) looks so tired? Dozer's smile is worth a 1000 smiles, don't you think...true joy! Bud loves the horses. I am just sure he thinks they are BIG dogs!